Okay, here is the deal, I had this coupon & coupon code up in the beginning of the week but I took it down because the coupon code had come from inside the package of batteries that you purchase and I felt it was not right of me to post it. Well, I noticed on a forum that they had gotten the link approved, so I decided to call the company myself and check. I spoke to Dawn over at Rayovac customer service and explained where I would be posting it and she said they knew about the access to the code and the unlimited prints and they have no problem with me giving it out on a public blog . In fact, she said, “go for it”. And so I am. Here is the info again. 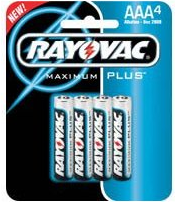 Print your $1/1 coupon for Rayovac Batteries here. Type in code: 74016761 (must type in, can not copy and paste). Coupon is for AA/AAA- 4 pkg, C/D – 2 pkg, 9V – 1 Pkg. Can possibly score some free batteries at Target and Walmart (I believe the AAA size is a 4 pkg and some Targets do have AA Alkaline batteries in their Dollar Spot as well). Just make sure the package size matches up. Note: This is a PDF coupon and some store will not take PDF coupon so please keep that in mind. If you feel uncomfortable about using this code and would like to verify it yourself, please call Rayovac customer service at 1-800-237-7000. They were very nice.